Wixey table saw digital readout. What am I doing wrong ? 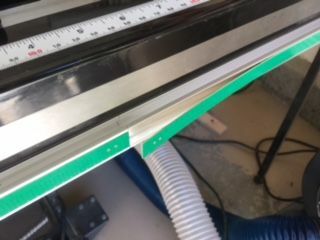 After installing a Wixey digital readout rail on my saw ( and discovering in the process that Irwin tap set is not worth the plastic it is packed into) I wiped it out twice with denaturated alcohol, removed the paper backing from the measuring strip and pressed it into the slot. Then I went several times over the strip and pressed it very hard to make sure it glues properly. However one end of the strip comes unglued no matter what I do to it. Any suggestions before resorting to calling the manufacturer and requesting a new strip ? Double sided tape may work. Shoe goo is remarkably tenacious stuff! Contact cement. 3M Spray 90, or just about any adhesive spray. Easily reversible with lacquer thinner.